The first new road bike I own and get to ride regularly in six years. This is the new dream ride. 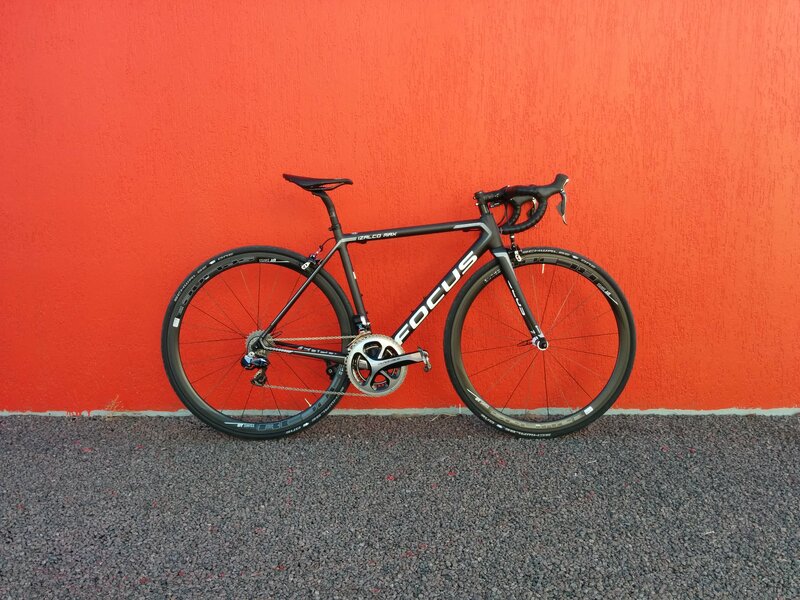 There are a plethora of reviews of the Focus Izalco Max out there, so I’ll try and describe the bike differently, and talk about what personally works for me, and will list anything I’ve changed from the stock bike. I have the Dura Ace Di2 incarnation of the Izalco Max, but it has quickly been renamed the Izalco Mini as I ride the XS (50cm). Upon collection from Blue Cycles, with the white bar tape fucked off in favour of a more suitable black Lizard Skin wrap, the bike felt immediately light, stiff and responsive. But I wasn’t yet sold on the Di2 or the fit of the bike. My saddle had been swapped out from the stock Fizik Antares Kium saddle (or what I prefer to call, “an onboard contraceptive device”) to the saddle that has been working for me for the last six months, an S-Works Power saddle. I don’t actually have anything against Fizik, but have never found a Fizik saddle that has worked for me, especially on longer rides. With my seat height seat correctly, the problem was the lay-back of the Focus CPX Carbon seat post – a real shame, as both Matt and Aidan had given positive feedback as to it’s compliance. An inline Enve post installed about a week later (with some effort) sorted out any fit issues I was having. And within a couple of rides, the Di2 felt like a great choice. Thus far, this climbing machine has mostly been subjected to straight-line, flat speed in Darwin, but has had a little action on some pinches in Litchfield as well as being the bike of choice for my most recent everesting. And climbing is where the bike really excels. Where on my old Giant I felt a nice resistance whilst putting out high watts on a short, uphill sprint, something I was both used to and gave me a good indication of my effort, the Izalco Mini lets me throw out the same power with considerably less resistance. I’ll keep it at that for climbing prowess for now, as i’m sure to add to the description in a longer term review. Onto handling, and this is where I think the Izalco Mini will really give me the biggest gains over my TCR Advanced. The old Giant always felt like it needed to be muscled around hard corners, just not feeling stiff enough in the front end in comparison to the rear, nor could I get low enough over the front wheel to give me much confidence. I’m yet to set the Izalco up very aggressively, but already it feels a much smoother, and more confidence inspiring bike on the corners. I think a short head tube assists with this, and when on the drops descending on that last everesting, I really felt able to rail the corners at speed. It handles how a bike should, with a feeling of the whole bike following through a turn, and no need to make corrections for the rear not tracking the same as the front. I’ll leave it at that for now, but there will be more to come.